Air Canada is the flag carrier and the largest airline of Canada by fleet size and passengers carried. The airline, founded in 1937, provides scheduled and charter air transport for passengers and cargo to 207 destinations worldwide. It is a founding member of the Star Alliance. Air Canada's corporate headquarters are in Montreal, Quebec, while its largest hub is at Toronto Pearson International Airport. The airline's regional service is Air Canada Express. Canada's national airline originated from the Canadian federal government's 1936 creation of Trans-Canada Airlines (TCA), which began operating its first transcontinental flight routes in 1938. In 1965, TCA was renamed Air Canada following government approval. After the deregulation of the Canadian airline market in the 1980s, the airline was privatized in 1988. On 4 January 2000, Air Canada acquired its largest rival, Canadian Airlines. In 2003, the airline filed for bankruptcy protection and in the following year emerged and reorganized under the holding company ACE Aviation Holdings Inc. In 2017, Air Canada flew 48 million passengers, as the airline celebrated its 80th anniversary. Air Canada has a fleet of Airbus A330, Boeing 767, Boeing 777, and Boeing 787 Dreamliner wide-body aircraft on long-haul routes and uses the Airbus A320 family aircraft (including the A319, A320, and A321 variants), Boeing 737 MAX 8, and Embraer E190 family aircraft on short-haul routes. The carrier's operating divisions include Air Canada Cargo, Air Canada Express, Air Canada Jetz (private jet charters), and Air Canada Rouge (leisure airline). Its subsidiary, Air Canada Vacations, provides vacation packages to over 90 destinations. Together with its regional partners, the airline operates on average more than 1,602 scheduled flights daily. Air Canada's predecessor, Trans-Canada Air Lines (TCA), was created by federal legislation as a subsidiary of Canadian National Railway (CNR) on 11 April 1937. The newly created Department of Transport under Minister C. D. Howe desired an airline under government control to link cities on the Atlantic coast to those on the Pacific coast. Using $5 million in Crown seed money, two Lockheed Model 10 Electras and one Boeing Stearman biplane were purchased from Canadian Airways and experienced airline executives from United Airlines and Delta Airlines were brought in. Passenger flights began on 1 September 1937, with an Electra carrying two passengers and mail from Vancouver to Seattle, a $14.20 round trip, and, on 1 July 1938, TCA hired its first flight attendants. Transcontinental routes from Montreal to Vancouver began on 1 April 1939, using 12 Lockheed Model 14 Super Electras and six Lockheed Model 18 Lodestars. By January 1940, the airline had grown to about 579 employees. Canadian Pacific Airlines (CP Air) suggested in 1942 a merger with TCA. Prime Minister William Lyon Mackenzie King rejected the proposal and introduced legislation regulating TCA as the only airline in Canada allowed to provide transcontinental flights. With the increase in air travel after World War II, CP Air was granted one coast-to-coast flight and a few international routes. Originally headquartered in Winnipeg, which was also the site of the national maintenance base, the federal government moved TCA's headquarters to Montreal in 1949; the maintenance base later also moved east. With the development of the ReserVec in 1953, TCA became the first airline in the world to use a computer reservation system with remote terminals. By 1964, TCA had grown to become Canada's national airline and, in 1964, Jean Chrétien submitted a private member's bill to change the name of the airline from Trans-Canada Airlines to Air Canada, which TCA had long used as its French-language name. This bill failed but it was later resubmitted and passed, with the name change taking effect on 1 January 1965. Elizabeth II, the reigning Queen of Canada, flew on the first aircraft to bear the name and livery of Air Canada when she departed for the United Kingdom at the end of her 1964 tour of Prince Edward Island, Quebec, and Ontario in 1964. During the 1970s government regulations ensured Air Canada's dominance over domestic regional carriers and rival CP Air. Short-haul carriers were each restricted to one of five regions, and could not compete directly with Air Canada and CP Air. CP Air was subject to capacity limits on intercontinental flights, and restricted from domestic operations. Air Canada's fares were also subject to regulation by the government. In 1976, with reorganization at CNR, Air Canada became an independent Crown corporation. The Air Canada Act of 1978 ensured that the carrier would compete on a more equal footing with rival regional airlines and CP Air, and ended the government's direct regulatory control over Air Canada's routings, fares, and services. The act also transferred ownership from Canadian National Railway to a subsidiary of the national government. Deregulation of the Canadian airline market, under the new National Transportation Act, 1987 officially opened the airline market in Canada to equal competition. The carrier's fleet expansion saw the acquisition of Boeing 727, Boeing 747, and Lockheed Tristar jetliners. In 1978 Judy Cameron became the first female pilot hired to fly for any major Canadian carrier when she was hired to fly by Air Canada. With new fleet expenditures outpacing earnings, Air Canada officials indicated that the carrier would need additional sources of capital to fund its modernization. By 1985 the Canadian government was indicating a willingness to privatize both Canadian National Railways and Air Canada. In 1988 Air Canada was privatized, and 43% of shares were sold on the public market, with the initial public offering completed in October of that year. By this time, long-haul rival CP Air had become Canadian Airlines International following its acquisition by Pacific Western Airlines. On 7 December 1987, Air Canada became the first airline in the world with a fleet-wide non-smoking policy, and in 1989 became completely privatized. The successful privatization program was led by the President and CEO, Pierre J Jeanniot. The associated extensive communication activities were aided by the Non-Executive Chairman, Claude I. Taylor. In the early 1990s, Air Canada encountered financial difficulties as the airline industry slumped in the aftermath of the Persian Gulf War. In response, the airline restructured management by hiring former Delta Air Lines executive Hollis L. Harris as its CEO. Harris restructured the airline's operations, reduced management positions, moved the corporate headquarters to Dorval Airport, and sold the enRoute card business to Diners Club in 1992. By 1994, Air Canada had returned to profitability. The same year also saw the carrier winning route access to fly from Canada to the new Kansai Airport in Osaka, Japan. In 1995, taking advantage of a new US-Canada open skies agreement, Air Canada added 30 new trans-border routes. In May 1997, Air Canada became a founding member of the Star Alliance, with the airline launching codeshares with several of the alliance's members. The second half of the 1990s saw the airline earn consistent profits, totalling $1 billion for the 1997 to 1999 period. On 2 September 1998, pilots for Air Canada launched the company's first pilots' strike, demanding higher wages. 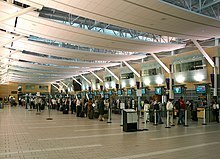 At the end of 1999, the Canadian government relaxed some of the aviation regulations, aimed at creating a consolidation of the Canadian airline industry. That year, American Airlines in conjunction with Canadian financial company Onex Corp, launched takeover bids for ailing rival Canadian Airlines and Air Canada, spurring Air Canada to submit a competing offer for its largest rival. In January 2001, Air Canada acquired Canada's second largest air carrier, Canadian Airlines, merging the latter's operations, becoming the world's twelfth-largest airline in the first decade of the 21st century. As Air Canada gained access to its former rival's financial statements, officials learned that the carrier was in worse financial shape than was previously believed. An expedited merger strategy was pursued, but in summer 2000 integration efforts led to flight delays, luggage problems and other frustrations. However, service improved following Air Canada officials' pledge to do so by January 2001. The airline was confronted by the global aviation market downturn and increased competition, posting back-to-back losses in 2001 and 2002. As Air Canada had employed a scorched earth policy to prevent the Onex proposed acquisition as one of its lines of defence, it had burdened itself with onerous contracts with almost all of its suppliers. As a result, on 1 April 2003, Air Canada filed for protection under the Companies' Creditors Arrangement Act; it emerged from this protection on 30 September 2004, 18 months later. During the period of bankruptcy protection, the company was subject to two competing bids from Cerberus Capital Management and Victor Li. The Cerberus bid would have seen former Prime Minister Brian Mulroney installed as chairman, being recruited by Cerberus' international advisory board chair Dan Quayle, the former Vice-President of the United States. Cerberus was rejected because it had a reputation of changing existing employee pension agreements, a move strongly opposed by the CAW. At first, Air Canada selected Victor Li's Trinity Time Investments, which initially asked for a board veto and the chairmanship in return for investing $650 million in the airline. Li, who holds dual citizenship from Canada and Hong Kong, later demanded changes to the pension plan (which was not in his original takeover bid), but since the unions refused to budge, the bid was withdrawn. Finally, Deutsche Bank unveiled an $850 million financing package for Air Canada, if it would cut $200 million in annual costs in addition to the $1.1 billion that the unions agreed on in 2003. It was accepted after last-minute talks between CEO Robert Milton and CAW president Buzz Hargrove got the union concessions needed to let the bid go through. ACE Aviation Holdings became the new parent company under which the reorganized Air Canada was held. However, in November 2012 ACE sold all shares and warrants it held in Air Canada. In October 2004, Canadian singer Celine Dion became the face of Air Canada, hoping to relaunch the airline and draw in a more international market after an 18-month period of bankruptcy protection. She recorded her single, You and I, which subsequently appeared in several Air Canada commercials. On 31 October 2004, the last Air Canada Boeing 747 flight landed in Toronto from Frankfurt as AC873, ending 33 years of 747 service with the airline. The Boeing 747-400 fleet was replaced by the Airbus A340 fleet. On 19 October 2004, Air Canada unveiled a new aircraft colour scheme and uniforms. A Boeing 767-300ER was painted in the new silver-blue colour, and the dark green/almost black tail was replaced with a new version of the maple leaf known as the 'Frosted Leaf'. On 9 November 2005, Air Canada agreed to renew its widebody fleet by purchasing 16 Boeing 777s (10 -300ERs, 6 -200LRs), and 14 Boeing 787-8s. It placed options on 18 Boeing 777s and 46 Boeing 787-8s and -9s. Deliveries of the 777s began in March 2007 and deliveries of the 787s began in May 2014. On 24 April 2007, Air Canada exercised half of its options for the Boeing 787 Dreamliner. The firm order for the Dreamliners then stood at 37 plus 23 options, for a total of 60. The airline also cancelled orders for two Boeing 777Fs. In November 2007, Air Canada leased an additional Boeing 777-300ER. Started in July 2006 and since completed, Project XM: Extreme Makeover, was a $300 million aircraft interior replacement project to install new cabins on all aircraft. New aircraft such as the Boeing 777 were delivered with the new cabins factory installed. In Executive First, new horizontal fully flat Executive First Suites (on Boeing 767s, Boeing 777s, and Airbus A330s). New cabins in all classes on all aircraft, with new entertainment options. Personal AVOD (8.9 in or 230 mm touchscreen LCD) in Economy class (domestic and international) and Executive Class (domestic). Larger AVOD (12 in or 300 mm touchscreen LCD) equipped with noise-cancelling Sennheiser headphones available in Executive First Suites. Interactive games at all seats in Executive and Economy; XM Radio Canada available at every seat. Since the late 2000s (decade), Air Canada has been facing a number of financial difficulties, including the global recession, leading to speculation that it could file for bankruptcy, less than a decade after it exited bankruptcy on 30 September 2004. President and CEO Montie Brewer was replaced by Calin Rovinescu effective 1 April 2009. Rovinescu became the first Canadian President since Claude Taylor in 1992. Rovinescu was Air Canada's chief restructuring officer during its 2003 bankruptcy (he resigned that year after unions rejected his demands) and is reported to be "an enforcer". Federal finance minister Jim Flaherty appointed retired judge James Farley, who had presided over Air Canada's 2003 bankruptcy, to mediate pension issues between the company, the unions representing its employees, and retirees. The contracts with four of the unions also expired around this time. The airline stated that its $2.85 billion pension shortfall (which grew from $1.2 billion in 2007) was a "liquidity risk" in its first-quarter report, and it required new financing and pension "relief" to conserve cash for 2010 operations. The company was obligated to pay $650 million into the pension fund but it suffered a 2009 Q1 loss of $400 million, so it requested a moratorium on its pension payments in 2009. The unions had insisted on financial guarantees before agreeing on a deal. In December 2010, ACE sold 44 million of Air Canada shares, followed by the remaining 31 million shares in November 2012 to Cormark Securities Inc. In 2013, Air Canada's practice of systematic overbooking was exposed. This much-criticized strategy, in which "the same seat is sold to more than one person," thereby causing ticket-holding passengers to be bumped and left stranded, persuaded the federal government to consider adopting an airline passenger bill of rights. In November 2014 Air Canada pilots voted by a majority of 84% in favour of a 10-year contract that allows the country's biggest passenger carrier to use arbitration or mediation to resolve disputes. A year later, the flight attendants also approved a 10-year agreement, apparently by a narrow (unstated) margin, with wage increases, increased job security and improvements to working conditions, according to Michel Cournoyer, the head of CUPE's Air Canada unit. On 9 February 2017, a new retro red and black aircraft livery was launched, to coincide with Air Canada's 80th anniversary and Canada's 150th anniversary of Confederation. The update includes design aspects from the logo used between 1964 and 1992, with an overall white colour scheme, with a black underside, tail fin with red maple leaf rondelle, black "Air Canada" lettering with a red maple leaf rondelle underneath, and a black "mask" surrounding the cockpit windows. Air Canada placed orders for Boeing 737 MAX single-aisle narrow body aircraft to replace its existing fleet of Airbus A320 series aircraft with the first MAX 8 variant delivered on 2 November 2017. Some Airbus Airbus A319s will be transferred to Air Canada's Rouge subsidiary, with the remaining fleet retired. As part of the deal, Boeing purchased 25 Embraer E190s from Air Canada that were retired in 2016. The same year, Air Canada signed an agreement with Bombardier Aerospace to replace the E190s with Airbus A220/CSeries aircraft from 2019. In July 2017, Air Canada reintroduced Premium Economy on its North American wide-body flights. In April 2018, Air Canada rebranded its international business class cabin as Air Canada Signature Class. Passengers could expect an enhanced menu, including the new Air Canada Signature Cocktail, in addition new amenity kits, a chauffeur service (using BMW vehicles) at its hubs during domestic to international connections, and access to the Air Canada Signature Suite at Toronto-Pearson International Airport. On select North American routes, Air Canada Signature Service is offered on widebody aircraft. In May 2018, Air Canada listed Taiwan as part of China to comply with a requirement of China's civil aviation administration. On 6 June 2018, Air Canada and Air China signed a joint venture, the first joint venture between a North American and Chinese airline. Air Canada became fully privatized in 1989, and its variable voting shares and voting shares shares are traded on the Toronto Stock Exchange (TSX:AC), and, since 29 July 2016, on OTCQX International Premier in the US under the single ticker symbol "ACDVF". Currently, the Air Canada Public Participation Act (ACPPA) limits ownership of Air Canada's voting interests by non-residents of Canada to a maximum of 25%. The Canada Transportation Act (CTA) also requires that Canadians own and control at least 75% of the voting interests of licensed Canadian carriers. Accordingly, Air Canada's articles contain restrictions to ensure that it remains "Canadian" as defined under the CTA. However, since May 2017, a House of Commons Bill has been in course ("Transportation Modernization Act" or "Bill C-49"), which among other things would increase foreign ownership limits in Canadian airlines from 25% to 49%. By federal law (Air Canada Public Participation Act), Air Canada has been obligated to keep its head office in Montreal. Its corporate headquarters is Air Canada Centre (French: Centre Air Canada), also known as La Rondelle ("The Puck" in French), a 7-storey building located on the grounds of Montréal–Pierre Elliott Trudeau International Airport in Saint-Laurent. In 1975, Air Canada was headquartered at 1 Place Ville-Marie in Montreal. In 1990, the airline moved its headquarters to the airport to cut costs. Prior to 1976, Air Canada was a department of the Canadian National Railway (CNR), helmed by a department head who reported to the President of CNR. Air Canada Cargo is the company's freight carrying division based at Toronto-Pearson, offering more than 150 shipping destinations through the Air Canada airline network, ground logistics and airline partners. Its route network has focused on European destinations through Eastern Canada departure points, along with direct services from Vancouver and Calgary to Frankfurt, London, Paris, and Zurich. In Toronto, a new cargo terminal was completed in early 2002 which featured modernised inventory and conveyor systems. Cargo terminals are also found in Vancouver and Montreal. Air Canada Vacations is a Canadian tour operator offering leisure travel packages including cruises, tours, car rentals and excursions. All packages include accommodation, Aeroplan Miles and roundtrip airfare aboard Air Canada and its Star Alliance partners. Repeat recipient of the Consumer's Choice Award for Best Travel Wholesaler and named Favourite Tour Operator by Baxter Travel Media in 2010, Air Canada Vacations services hundreds of destinations in the Caribbean, Mexico, North, Central and South America, Asia, South Pacific and Europe. Air Canada Vacations is headquartered in Montreal, has an office in Toronto, and destination representatives are available throughout the Caribbean, Mexico, Europe, Asia, South Pacific, and South America. Air Canada Vacations offers Executive Class service on select flights, nonstop flights from major Canadian cities and daily flights to many destinations. Launched in December 2012, Air Canada Rouge is a low-cost subsidiary of Air Canada. Air Canada Rouge serves predominantly leisure destinations in Europe, Asia, Africa, the Caribbean, South America, Central America, Mexico and the United States using Airbus A319, Airbus A321, and Boeing 767-300ER aircraft. Air Canada Express is the brand name of Air Canada's regional feeder service operated by several independent carriers including Jazz Aviation, Sky Regional Airlines, Exploits Valley Air Services (EVAS), and Air Georgian. Launched in 2002, Air Canada Jetz is a charter service targeting sports teams, professional entertainers, and corporations. The Air Canada Jetz fleet consists of three Airbus A319s in an all business class configuration. In February 2014, Air Canada decided to leave the sports charter business. However, on 17 March 2015, Air Canada announced an agreement with several NHL teams to provide charter services under the Air Canada Jetz brand for six years starting from the 2015-2016 NHL season. Aeroplan is Air Canada's loyalty marketing program operated by Groupe Aeroplan Inc., which was spun off from Air Canada in 2005. However, as of 26 November 2018, Air Canada has signed a definitive agreement to re-purchase Aeroplan from Aimia Inc. Air Canada completed the purchase in January 2019. In 2001, Air Canada consolidated its wholly owned regional carriers Air BC, Air Nova, Air Ontario, and Canadian Regional Airlines into Air Canada Regional Incorporated. Several of these air carriers had previously operated as an "Air Canada Connector". In 2002, the consolidation was completed with the creation of a new brand, Air Canada Jazz. Air Canada Jazz was spun off in November 2006. ACE Aviation Holdings is no longer a shareholder of Jazz Aviation LP, making it an independent company. Air Canada Jazz was the brand name of Air Canada's main regional product from 2002-2011. As of June 2011, the Air Canada Jazz brand is no longer being marketed as all regional operators adopted the Air Canada Express name. Jazz Aviation is the largest of these affiliates, operating 125 aircraft on behalf of Air Canada. In 2002, Air Canada launched a discount airline to compete directly with WestJet on routes in Western Canada. Zip operated ex-Canadian Airlines International 737-200s as a separate airline with its own staff and brightly painted aircraft. It was disbanded in 2004. On 1 November 2001, Air Canada launched Air Canada Tango, designed to offer no-frills service and lower fares using a dedicated fleet of 13 Airbus A320s in an all economy configuration of 159 seats. In Canada, it operated from Toronto to Vancouver, Calgary, Edmonton, Winnipeg, Regina, Saskatoon, Thunder Bay, Ottawa, Montreal, Halifax, Gander and St. John's. In addition, it operated non-stop service between Toronto and Fort Lauderdale, Orlando and Tampa; as well as non-stop service between Montreal and Fort Lauderdale and Orlando. Tango was intended to compete with Canada 3000. The Tango service was dissolved in 2004. Air Canada now calls its lowest fare class "Tango". As of 2018, Air Canada has renamed the Tango fare class to Standard fare. Air Canada flies to 64 domestic destinations and 158 international destinations across Asia, the Americas, Europe, and Oceania. Along with its regional partners, the carrier serves over 222 destinations in 47 countries, on six continents worldwide. Air Canada had flown a number of fifth freedom routes (passenger and cargo rights between two non-Canadian destinations). Past fifth freedom routes have included: Honolulu-Sydney, London Heathrow-Düsseldorf, Paris-Geneva, Paris-Munich, Paris-Berlin, Frankfurt-Zürich, Zürich-Zagreb, Zürich-Vienna, Zürich-Delhi, Lisbon-Madrid, Brussels-Prague, London Heathrow-Delhi, London Heathrow-Nice, London Heathrow-Mumbai-Singapore, Montego Bay-Kingston (KIN), and Santiago-Buenos Aires. However, these were replaced with nonstop routes: Vancouver-Sydney, Toronto-Munich, Toronto-Zürich, Vancouver-Zürich, Toronto-Vienna, Toronto-Delhi, Vancouver-Delhi, Toronto-Madrid, and Toronto-Mumbai. The Air Canada mainline fleet consists of the following registered aircraft (as of March 2019). Airbus A220-300 — 45 TBA Order with 30 options. Deliveries from December 2019 through 2022. To replace Airbus A319 and Embraer 190. 3 — 58 — — 58 Used for VIP charters under the Air Canada Jetz brand. Airbus A330-300 9 4 27 — 21 244 292 To be reconfigured with the new Boeing 787-style cabin starting late 2019. Boeing 737 MAX 8 24 26 — 16 — 153 169 Order with 18 options and 30 purchase rights. Boeing 767-300ER 6 — 24 — — 187 211 To be phased out in 2019. Boeing 787-9 28 1 30 — 21 247 298 Order with 13 options and 10 purchase rights. Embraer 190 18 — — 9 — 88 97 To be phased out in 2020. To be replaced by Airbus A220-300 and Boeing 737 MAX 8. Air Canada's Douglas DC-8-63 fleet was withdrawn from passenger service in 1983. Six of these were converted to DC-8-73F freighters in 1984 and retained for use by Air Canada Cargo eventually being sold off between 1990 and 1994. Air Canada's Douglas DC-9-15s were used up to 1968. One DC-9-32CF was used for cargo flights until 1977. The McDonnell Douglas DC-9-32s were used from 1967 to 2002. Air Canada's Canadair Regional Jet (CRJ) aircraft were used from the mid 1990s until the early 2000s when they were transferred to regional affiliate Jazz Air LP operating as Air Canada Jazz. Air Canada's Airbus A340-500s were retired in November 2007 and replaced by Boeing 777-200LRs. Air Canada was the only North American airline to operate the A340. Air Canada's Airbus A340-300s were retired in November 2008 and replaced by Boeing 777-300ERs. Air Canada's Boeing 767-200ER fleet was retired from service by the end of 2008. The McDonnell Douglas DC-10 aircraft were operated from 1979-2000 by Canadian Pacific Airlines and its successors CP Air and Canadian Airlines. The Boeing 737-200 aircraft were operated from 1968-2000 by Canadian Pacific Airlines and its successors CP Air and Canadian Airlines. Subsequent to the merger with Canadian Airlines, Air Canada operated these aircraft in a mainline two-class configuration, as well as in an all-economy class configuration with the Air Canada Tango and the Zip low cost carrier brands. British Aerospace 146-200 and Fokker F28 jet aircraft were operated by regional airline affiliates of Air Canada via code sharing agreements. Air Canada has three classes of service, Business/Signature, Premium Economy, and Economy. On most long-haul international and short-haul routes operated by widebody aircraft, Signature Class, Premium Economy Class, and Economy Class are offered; most short-haul and domestic routes feature Business Class and Economy Class. All mainline seats feature AVOD (Audio Video On Demand) and mood lighting. Air Canada Express features Business Class and Economy Class, on CRJ900 and Embraer 175 aircraft; all other Air Canada Express aircraft have one-class economy cabins. All narrowbody mainline aircraft, as well as Air Canada Express Bombardier CRJ900 and Embraer 175 aircraft have onboard WiFi installed, which is also being installed on all widebody aircraft. In the spring of 1987, Air Canada enacted no-smoking flights between Canada and New York City as a test. After a survey reported that 96% of passengers supported the smoking ban, Air Canada extended the ban to other flights. Air Canada's Signature Class cabins are available on all widebody aircraft. There are two different cabins available: the Executive Pod and the Classic Pod. All services feature AVOD (Audio Video On Demand) on a touch screen, noise cancelling headphones, and music provided by XM Satellite Radio. Executive Pods are featured on all Boeing 777s and 787s. These seats feature electronic flat beds in a 1–2–1 reverse herringbone configuration with a 21-inch (53.3 cm) seat width and a 6-foot-7-inch (2.01 m) seat pitch. AVOD is provided with an 18-inch (45.7 cm) touch screen. Classic Pods feature electronic flat beds, in a 1–1–1 herringbone configuration on all Boeing 767-300ER and Airbus A330-300s with a 21-inch (53.3 cm) seat width and a 6-foot-3-inch (1.91 m) seat pitch. AVOD is provided with a 12-inch (30.5 cm) touch screen. Within North America, Business Class is Air Canada's premium product. On Embraer 190 aircraft (mainline) and Embraer 175 and CRJ900 aircraft (Air Canada Express), the seat configuration is 1–2 abreast, with recline around 120°, and a width of 20 inches (0.51 m). On Airbus and Boeing narrow-body aircraft, seat configuration is 2–2 abreast, with 124° recline, and 21 inches (0.53 m) width. The seat pitch is 37 to 38 inches (0.94 to 0.97 m). All seats feature AVOD and music is provided by XM Satellite Radio. On Trans-Atlantic flights operated with the Boeing 737 MAX 8, this cabin is sold as Premium Economy. Premium Economy class is available on all Airbus A330, Boeing 777, and Boeing 787 aircraft. It features a larger seat and greater recline as compared to economy class, in a 2–4–2 configuration (Boeing 777) or 2–3–2 configuration (Airbus A330 and Boeing 787) with a 20-inch (0.508 m) (Boeing 777) or 19.5-inch (0.495 m) (Boeing 787) seat width and a 37 to 38 inches (0.94 to 0.97 m) seat pitch. Entertainment is personal AVOD (Audio Video On Demand), while music is provided by XM Satellite Radio. Air Canada Rouge operates flights on its aircraft with a premium economy class product, branded as Premium Rouge. This is sold as a business class product on Rouge flights within North America. In Economy Class, seats are pitched 30 to 32 inches (0.76 to 0.81 m) with a width of 17.2 to 18.5 inches (0.44 to 0.47 m) and a recline to 4.5 to 6 inches (0.11 to 0.15 m). On Air Canada Rouge aircraft, seats are pitched 29 to 30 inches (0.74 to 0.76 m) with a width of 17.5 to 18 inches (0.44 to 0.46 m) and 3 inches (0.076 m) of recline. Configuration is 3–4–3 on the Boeing 777, 3–3–3 on the Boeing 787, 2–4–2 on the Airbus A330, 2–3–2 on the Boeing 767, 3–3 on Boeing and Airbus narrowbody aircraft, and 2–2 on Bombardier and Embraer aircraft. 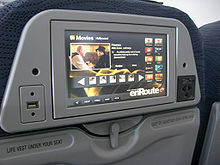 All Airbus, Boeing, and Embraer aircraft, as well as the CRJ900 are fitted with personal AVOD (audio-video on demand). Music is provided by XM Satellite Radio. Complimentary meals are offered on all international flights outside of North America. For domestic, North American, sun destination and Caribbean flights, food and alcoholic beverages can be purchased through Air Canada Bistro (GuestLogix point of sale terminals are used) while non-alcoholic beverages are complimentary. On all narrowbody aircraft, there is an extra legroom Preferred Seat section in the front few rows and exit rows of the economy cabin which provides up to 4 inches (0.10 m) more seat pitch (usually at least 35"). All Air Canada Rouge planes offer Rouge Plus seats, which are identical to the Preferred Seats, but with up to 6 inches (0.15 m) more seat pitch (35" on A319s and 36" on 767s) as well as an additional 2 inches (0.051 m) of recline. Air Canada Express flights operated by CRJ200, Dash 8-100/300/Q400 aircraft offer a bar and refreshment service on board. The CRJ900 and E175 features Business Class and personal AVOD at every seat. Flights on board the E175, CRJ200/900 and Q400 which are 90 minutes or more feature Onboard Café . On 9 February 2017, a new uniform scheme coinciding with Canada's 150th and Air Canada's 80th anniversaries was unveiled. Air Canada partnered with Vancouver-born fashion designer Christopher Bates to design the new uniforms which incorporate a base colour of black or grey with red lettering and the famous maple leaf. Between 2004 and 2017, Air Canada uniforms used a midnight blue colour. The uniforms were designed by Canadian fashion designer Debbie Shuchat. At a presentation in the Toronto Airport hangar, Celine Dion helped the newly-solvent airline debut its new image. Air Canada has 23 Maple Leaf Lounges located at all major airports across Canada and at international locations including London-Heathrow, Paris-Charles de Gaulle, Frankfurt, Los Angeles and New York-LaGuardia. The Maple Leaf Lounges are available to passengers holding a same day ticket on Air Canada in Business Class, Star Alliance Gold Members, Air Canada Super Elite, Air Canada Elite, Air Canada Maple Leaf Club members, American Express Maple Leaf Club members, American Express AeroplanPlus Platinum holders, holders of a one time guest pass or economy passengers who have purchased lounge access during booking. Air Canada shares an Arrivals Lounge at London Heathrow Terminal 2 with some other Star Alliance members. It is available to eligible passengers arriving into London from any Air Canada international flight, holding a confirmed same-day overseas travel boarding card. Eligible groups include Business Class Passengers, Air Canada Super Elite, Air Canada Elite, Air Canada Maple Leaf Club Members or American Express Maple Leaf Club. Travellers who hold paid memberships to affiliated Star Alliance lounges, such as the United Club, are also eligible for access to Maple Leaf Lounges. Aeroplan is Air Canada's frequent flyer rewards program, both allowing for points collection and spending, as well as status and rewards as an Air Canada customer. After Air Canada and Aeroplan changed the division of points collection and redemption, Air Canada introduced an internal rewards program, Altitude. The two programs operate in conjunction. On 11 May 2017, Air Canada announced it plans to launch a new loyalty program to replace Aeroplan and Altitude in 2020. On 10 January 2019, Air Canada re-acquired Aeroplan from Aimia. On 20 September 2012, Air Canada unveiled its new frequent flyer status program named "Air Canada Altitude" to supplement Aeroplan. Aeroplan remained the frequent flyer rewards program, collecting miles which can be "spent", whereas status level is determined by Altitude standing. There are five levels of membership in Air Canada's Altitude Program: Basic, Prestige 25K, Elite 35K, Elite 50K, Elite 75K and Super Elite 100K. The latter three are called "Top Tier" membership levels and provide travel benefits such as upgrades, lounge access, priority services (e.g., check-in, luggage handling), and bonuses when earning miles through air travel. In order to qualify for these levels, a member must earn, through flight activities, a certain number of miles or a certain number of segments and spending some level of money. Altitude refers to these as Altitude Qualifying Miles (AQM), Segments (AQS), and Dollars (AQD). Prestige members and Altitude Elite 35 K receive Star Alliance Silver status, while Elite 50K, Elite 75K, and Super Elite 100K members receive Star Alliance Gold status. Air Canada Status Miles are calculated on an annual basis (1 January through 31 December) to determine Altitude Membership Status for the following benefit year (1 March through 28 February). At the 35K and above levels, that level of status is granted when achieved, for the remainder of the current year, as well as for the next year. For incidents before 1963, see Trans-Canada Air Lines. 13 June 1964 3277 Vickers Viscount registration CF-THT was damaged beyond economical repair when it crash-landed at Toronto Airport after the failure of two engines on approach. 19 May 1967 McDonnell Douglas DC-8-54F CF-TJM crashed and burned on a training flight while making a three-engine landing at Ottawa, Ontario. All three crew members were killed. There were no passengers on the flight. 11 September 1968 A Vickers Viscount of Air Canada was hijacked by a Cuban passenger. 7 September 1969 Vickers Viscount registration CF-THK was damaged beyond economic repair by a fire which occurred on takeoff from Sept-Îles Airport. The aircraft landed back at Sept-Îles, but one passenger was killed in the fire. 1 March 1970 106 Vickers Viscount CF-THY collided in mid-air with Ercoupe 415 CF-SHN on approach to Vancouver International Airport. The Ercoupe pilot was killed. 5 July 1970 621 McDonnell Douglas DC-8-63 registration CF-TIW exploded from a fuel line rupture caused by engine 4 striking the runway in Toronto, Ontario during a landing attempt. All 109 passengers/crew were killed. 26 December 1971 932 McDonnell Douglas DC-9-32, Flight departed Thunder Bay, Ontario for Toronto, Ontario. Hijacker Patric Dolan Critton passed a note 20 minutes before landing that read: "Think. We have fragmentary grenades, and a .38 caliber revolver. Take me to the captain. We're going to Havana. This is no joke." The hijacker permitted the 82 passengers on board to get off the aircraft before the flight was rerouted to Cuba. After leaving the hijacker in Havana, the Air Canada aircraft safely returned to Toronto. Citton was arrested in New York on other charges in 2001 and, after serving his sentence, was extradited to Canada where he was charged with kidnapping. In 1971 there was no offence of hijacking in the Canadian Criminal Code. He was sentenced to five years in prison but was released on parole after serving two years. 21 June 1973 890 McDonnell Douglas DC-8-53, registration CF-TIJ caught fire and was burnt out during refuelling at Terminal 2, Toronto Pearson International Airport, Ontario; no fatalities. 26 June 1978 189 McDonnell Douglas DC-9-32, registration CF-TLV overran the runway in Toronto after a blown tire aborted the takeoff. Two of the 107 people on board were killed. 2 June 1982 McDonnell Douglas DC-9-32 registration C-FTLY exploded during a maintenance period in Montreal, Quebec; no fatalities. 2 June 1983 797 McDonnell Douglas DC-9-32 C-FTLU had an electrical fire in the aft lavatory during flight, resulting in an emergency landing at Cincinnati/Northern Kentucky International Airport. During the emergency evacuation, the sudden influx of oxygen caused a flash fire throughout the cabin, resulting in the deaths of 23 of the 41 passengers, including Canadian folk singer Stan Rogers. All five crew members survived. The captain was the last person to exit the aircraft. This incident was also featured as "Fire Flight" of Canadian television series Mayday season 4 episode 3 (known as "Fiery Landing" of Air Emergency in the USA, Air Crash Investigation in the UK and Australia). This is Air Canada's most recent fatal accident. 23 July 1983 143 Boeing 767-200 registration C-GAUN glided to an emergency landing in Gimli after running out of fuel 12,300 metres (40,400 ft) above Red Lake, Ontario. Some people suffered minor injuries during the evacuation due to the steep angle of the escape slides at the rear of the aircraft, caused by the collapse of the nose gear. This incident was the subject of the TV movie, Falling from the Sky: Flight 174 and the book, Freefall, by William Hoffer. This incident was also featured on the National Geographic Channel and Discovery Channel series Mayday season 5 episode 6. This flight is generally known as the Gimli Glider. 16 December 1997 646 Air Canada Flight 646 departed Toronto-Lester B. Pearson International Airport, Ontario, at 9:24 PM eastern standard time on a scheduled flight to Fredericton, New Brunswick. On arrival, the Canadair CRJ-100 aircraft, registration C-FSKI, experienced an unstabilized approach in poor visibility and stalled aerodynamically during a late go-around attempt. The aircraft skidded 2,100 feet (640 m) from the point of touch down and hit a tree. An evacuation was conducted; however, seven passengers were trapped in the aircraft until rescued. Of the 39 passengers and 3 crew members, 9 were seriously injured and the rest received minor or no injuries. The accident occurred at 11:48 PM Atlantic standard time. Air Canada was heavily criticized in the media over its employees allegedly entering the crash site and removing the aircraft decals identifying its operator without the permission of the authorities. 10 January 2008 190 Air Canada Flight 190 was a scheduled flight from Victoria International Airport to Toronto Pearson International Airport. Whilst cruising over the Rocky Mountains, the Airbus A319 operating the flight lost attitude control and significant height in a short moment. The flight made an emergency landing at Calgary International Airport. Of the 83 passengers and 5 crew on board, 10 people were hospitalized for non-life-threatening injuries and most were subsequently released later on that day. All passengers were later accommodated on other flights to continue their journey to Toronto. A likely cause of the incident was due to wake turbulence. 29 March 2015 624 Air Canada Flight 624 was an Airbus A320 C-FTJP flying from Toronto Pearson International Airport to Halifax Stanfield International Airport. After 15 minutes in a holding pattern due to a severe winter storm and poor visibility, during approach in Halifax, the plane impacted the runway approach lights and power lines knocking out power and communications at the airport. It then impacted the ground 300m short of the runway, continuing on to impact the localizer antenna array, and breaking off its landing gear. The plane then touched down a second time and slid down the runway, losing one of its engines. All 133 passengers and 5 crew evacuated and survived. 23 people were sent to the hospital with non-life-threatening injuries. The aircraft was written off. 7 July 2017 759 At the conclusion of the regularly scheduled international passenger flight from Toronto to San Francisco, Air Canada Flight 759 nearly landed on a taxiway which already had four fully loaded and fueled airplanes holding short for takeoff. A retired pilot stated the runway confusion that almost happened "probably came close to the greatest aviation disaster in history" as five airplanes and over 1,000 passengers were at imminent risk. The NTSB completed a major investigation. ^ a b c d e f "Air Canada History". CBC News. 14 May 2004. Archived from the original on 31 March 2009. Retrieved 4 April 2009. ^ a b "Timeline - Air Canada's 80th Anniversary". moments.aircanada.com. ^ "Air Canada Altitude". altitude.aircanada.com. ^ a b c "Air Canada Corporate Profile". www.aircanada.com. ^ Air Canada (30 March 2009). "Air Canada announces appointment of Calin Rovinescu as President & Chief Executive Officer". CNW Telbec. Archived from the original on 4 September 2015. Retrieved 4 April 2009. ^ "Star Alliance Member Airline - Air Canada". Star Alliance. Archived from the original on 17 April 2009. Retrieved 4 April 2009. ^ "Investors Contacts Archived 4 February 2016 at the Wayback Machine" Air Canada. Retrieved on 18 May 2009. ^ "Revenue passengers carried" (PDF). Air Canada Reports 2017 Annual Results. ^ a b "Air Canada Annual Report 2017" (PDF). Air Canada. Retrieved 27 May 2018. ^ a b c d e f g "Indepth: Air Canada Timeline". CBC News. 20 June 2005. Archived from the original on 21 April 2006. Retrieved 4 April 2009. ^ a b c d e f g h i j k "Air Canada: Celebrating 70 Years of Leadership". Aviation Week & Space Technology. Archived from the original on 15 January 2010. Retrieved 11 January 2010. ^ Sparling, Gordon; Bala, Nicholas (1964). The Queen in Canada (Digital video). Ottawa: National Film Board of Canada. ^ a b c d e f g h i j k l m "Air Canada – Company History". International Directory of Company Histories. 2009. Retrieved 19 August 2009. ^ Christopher, John; Dion, Joseph P. (14 November 2002). "Issue Definition". The Canadian Airline Industry. Government of Canada / Depository Services Program. Retrieved 4 April 2009. ^ "Flight Training Organization | How To Become A Commercial Pilot - Part 4". Tgblogsite.com. 10 April 1978. Retrieved 23 May 2015. ^ "Air Canada Innovations". Air Canada. Archived from the original on 30 April 2009. Retrieved 24 May 2009. ^ "Air Canada Sells Credit Card Unit". The New York Times. 27 March 1992. Retrieved 24 May 2009. ^ "Air Canada Strike Settled". Maclean's. 21 September 1998. Archived from the original on 13 February 2009. Retrieved 24 May 2009. ^ "Air Canada unions dig in, rescue deal seen at risk". Usatoday.com. 5 April 2004. Retrieved 21 February 2011. ^ Yusufali, Sasha. "Air Canada". The Canadian Encyclopedia. Retrieved 12 January 2010. ^ "ACE Aviation". ACE Aviation. 31 January 2011. Retrieved 21 February 2011. ^ Renée Alexander (10 May 2006). "WestJet Airlines - High Times". Businessweek.com. Retrieved 21 February 2011. ^ Gigacz, Oliver (16 May 2016). "Boeing Delivers Air Canada's First 787 Dreamliner". Global Aviation Express. Retrieved 16 May 2014. ^ "Boeing, Air Canada Announce 23 Additional 787 Dreamliners". 25 April 2007. Archived from the original on 19 January 2010. Retrieved 12 January 2010. ^ Jang, Brent (31 March 2009). "Brewer resigns as Air Canada Chief". Globe and Mail. Retrieved 25 January 2015. ^ Canada (31 March 2009). "Air Canada drafts an enforcer "He's a fixer, and comfortable with confrontation, not an airline operator."". Toronto: Business.theglobeandmail.com. Archived from the original on 3 April 2009. Retrieved 21 February 2011. ^ "Flaherty appoints ex-judge to mediate Air Canada pension issues". cbc.ca. 4 June 2009. Archived from the original on 7 June 2009. Retrieved 21 February 2011. ^ "ACE History and Background" (PDF). ACE Aviation. January 2011. Retrieved 14 March 2019. ^ "ACE Aviation". Archived from the original on 4 September 2015. Retrieved 24 April 2015. ^ a b "Couple incensed as Air Canada overbooking continues". cbc.ca. 3 October 2013. Retrieved 7 October 2013. ^ "John Ivison: Throne Speech's 'consumers first' agenda will likely pit Tories against airlines and telcos". nationalpost.com. 17 September 2013. Archived from the original on 12 October 2013. Retrieved 7 October 2013. ^ "Air Canada pilots vote overwhelmingly for 10-year contract". Market Business News. 1 November 2014. ^ "Air Canada flight attendants ratify 10-year deal". CBC News. 18 November 2015. Retrieved 19 November 2015. ^ "Our Nation's Carrier" (PDF). Air Canada. 2017. Retrieved 5 November 2017. ^ Cline, Andy (November 2, 2017). "Air Canada takes its first Boeing 737 MAX". Skies Mag. Retrieved November 5, 2017. ^ a b c "Air Canada to Purchase Bombardier C Series as Part of its Fleet Renewal Program" (Press release). Air Canada. 17 February 2016. Retrieved 4 December 2016. ^ "Air Canada Travel News and Updates". www.aircanada.com. Retrieved 2017-06-15. ^ "Air Canada move to list Taiwan as part of China sees backlash, threat of boycot". thestar.com. Retrieved 12 June 2018. ^ "Air Canada, Air China sign agreement to boost co-operation on Canada-China flights". Global News. 6 June 2018. Retrieved 12 June 2018. ^ "Bill C-49 Transportation Modernization Act". openparliament.ca. Retrieved 2 January 2019. ^ a b "Annual Report 2012" (PDF). Air Canada. Retrieved 24 May 2013. ^ "Annual Report 2008" (PDF). Air Canada. Retrieved 25 May 2013. ^ "Annual Report 2009" (PDF). Air Canada. Retrieved 25 May 2013. ^ a b "Annual Report 2010" (PDF). Air Canada. Retrieved 25 May 2013. ^ a b "Annual Report 2011" (PDF). Air Canada. Retrieved 24 May 2013. ^ "News Release Q4 2013" (PDF). Air Canada. Retrieved 9 March 2014. ^ "Annual Report 2014" (PDF). Air Canada. Retrieved 12 April 2015. ^ "Annual Report 2015" (PDF). ^ "Air Canada Annual Report 2016" (PDF). ^ "Air Canada Annual Report 2017" (PDF). ^ "2018 Annual Report" (PDF). Air Canada. Retrieved 18 April 2019. ^ "Bill C-29: An Act to amend the Air Canada Public Participation Act (LS-536E)". Parl.gc.ca. Archived from the original on 2 April 2013. Retrieved 23 May 2012. ^ "Air Canada Public Participation Act (R.S.C., 1985, c. 35 (4th Supp.))". Justice Laws Website. Government of Canada. Retrieved 13 May 2018. ^ "Investors Contacts Archived 4 February 2016 at the Wayback Machine." Air Canada. Retrieved on 4 December 2010. "Air Canada Centre, 7373 Côte-Vertu Blvd. West Saint-Laurent, Quebec H4S 1Z3." ^ "Coordonnées - Investisseurs Archived 4 February 2016 at the Wayback Machine." Air Canada. Retrieved on 4 December 2010. "Centre Air Canada, 7373 boul. Côte-Vertu Ouest Saint-Laurent (Québec) H4S 1Z3." ^ Israelson, David (11 September 1994). "Companies eye exits in case of separation". Toronto Star. Retrieved 23 September 2009. ^ "FAQ’s." Air Canada. Retrieved on 4 December 2010. "Our headquarters are located at 7373 Boulevard Côte-Vertu Ouest, Dorval, Quebec." ^ World Airline Directory. Flight International. 20 March 1975. p. 465. Retrieved 24 May 2009. ^ "Air Canada layoffs blamed on free trade." Toronto Star. 10 October 1990. A1. Retrieved on 23 September 2009. ^ "Executive Biographies". aircanada.com. 24 November 2008. Retrieved 21 February 2011. ^ a b "Air Canada Cargo profile". Accessmylibrary.com. 1 October 1996. Retrieved 21 February 2011. ^ "Air Canada opens modern new cargo terminal at Toronto hub" (PDF). Air Canada. 28 January 2002. Archived from the original (PDF) on 17 September 2010. Retrieved 26 May 2009. ^ "Neue Direktverbindung Berlin-Toronto ab Sommer 2017". Deutsch-Kanadische Gesellschaft. Archived from the original on 12 June 2018. Retrieved 26 October 2016. ^ "Canadian Civil Aircraft Register". Transport Canada. Retrieved October 4, 2017. ^ "About EVAS Air". Exploits Valley Air Services. Retrieved 21 September 2011. ^ "Aeroplane Miles earned partners". Aircanada.com. 16 June 2010. Retrieved 21 February 2011. ^ "ottawacitizen.com - Senators look for a new ride to road games as Air Canada exits charter business". Archived from the original on 2014-06-17. ^ "Air Canada to Carry Canada's Top Professional Hockey Teams". Air Canada Media Centre. Retrieved 17 March 2015. ^ Leader, The (10 February 2007). "ACE to spin off unit". Canada.com. Archived from the original on 4 June 2011. Retrieved 21 February 2011. ^ "Air Canada signs definitive deal to buy Aeroplan program for $450 million". CTVNews. 2018-11-26. Retrieved 2018-11-26. ^ "Air Canada Completes Acquisition of Aeroplan Loyalty Business". 2019-01-14. Retrieved 2018-01-18. ^ "History". flyjazz.ca. Archived from the original on 7 March 2009. Retrieved 31 October 2008. ^ CNW Group (10 October 2001). "Air Canada Gets Costs Out With Tango; Reassigns Existing Capacity to Offer Unique, No-Frills, Value-Focussed Alternative to Full Service Mainline Network". nieuwsbank.nl. Retrieved 12 January 2010. ^ "Air Canada fare structure". Aircanada.com. 24 November 2008. Archived from the original on 27 May 2010. Retrieved 21 February 2011. ^ "Economy Fares". Aircanada.com. 30 June 2018. Retrieved 30 June 2018. ^ "Air Canada expands in Europe". Flightglobal.com. 10 March 1984. Retrieved 21 February 2011. ^ "Air Canada aims at business traveler with Singapore route". News.google.com. 12 January 1985. Retrieved 21 February 2011. ^ "Profile on Air Canada". CAPA. Centre for Aviation. Archived from the original on 2016-10-30. Retrieved 2016-10-30. ^ "Air Canada / Adria begins codeshare partnership in 4Q18". Routesonline. 7 December 2018. ^ "Cathay Pacific signs codeshare deal with Air Canada". ^ a b "Fin Numbers". Air Canada. Retrieved 5 April 2019. ^ a b c d e f g h i "Q4 2018 MDA" (PDF). 15 February 2019. ^ "ST Aerospace Secures Interior Reconfiguration Contract from Air Canada for its A330-300 Fleet". 10 April 2018. Retrieved 17 April 2018. ^ "Q1 2018 MDA" (PDF). 30 April 2018. ^ "Air Canada Welcomes First Boeing 787-9 Dreamliner to its Fleet". Air Canada. Retrieved 31 July 2015. ^ "PlaneRegister.com - Air Canada historical Airbus A340". Planesregister.com. Archived from the original on 15 July 2011. Retrieved 21 February 2011. ^ "Air Canada Fleet of A340 (History) | Airfleets aviation". Airfleets.net. Retrieved 21 February 2011. ^ Kramon, Glenn. "Northwest Airlines Bans Smoking on Most Flights." The New York Times. 24 March 1988. 1. Retrieved on 8 February 2012. ^ "Air Canada Signature Service". Air Canada. Retrieved 17 April 2017. ^ a b "Air Canada Expands Introduction of New International Business Class and Premium Economy Seating". aircanada.com. Archived from the original on 19 November 2014. Retrieved 18 November 2014. ^ "Premium Economy (International)". aircanada.com. Retrieved 30 June 2013. ^ "Air Canada shows off new colour schemes for planes and staff uniforms". ^ "Air Canada Maple Leaf Lounge". Air Canada. Retrieved 23 May 2014. ^ "Air Canada Maple Leaf Lounge Locations". Air Canada. Retrieved 23 May 2014. ^ "Maple Leaf Lounge access". Air Canada. Retrieved 23 May 2014. ^ "Air Canada Arrivals Lounge". Air Canada. Retrieved 23 May 2014. ^ "Lounge Access Policy". Star Alliance. Retrieved 29 October 2016. ^ "Galleries Aimia shares crash after Air Canada parts ways with Aeroplan loyalty program". 11 May 2017. Retrieved 12 May 2017. ^ "Accident description". Aviation Safety Network. Retrieved 6 October 2009. ^ "Accident description". Aviation Safety Network. 19 May 1967. Retrieved 24 May 2009. ^ "Accident description". Aviation Safety Network. Retrieved 8 October 2009. ^ "Accident synopsis 07051970". AirDisaster.com. 5 July 1970. Retrieved 24 May 2009. ^ "1971: Canada's first successful plane hijacking". cbc.ca. 22 October 2014. Retrieved 1 February 2015. ^ "Canada's First Successful Plane Hijacking". noahc.org/. Retrieved 1 February 2015. ^ "Hull-loss description". Aviation Safety Network. 21 June 1973. Retrieved 24 May 2009. ^ "Accident synopsis 06261978". 26 June 1978. Retrieved 24 May 2009. ^ "44 in drama over Atlantic as DC-9 jet's tail rips off". The Toronto Star. 18 September 1979. p. 1. ^ "Nation: Air Scares". Time. 1 October 1979. ^ "Accident Database". AirDisaster.com. 2 June 1982. Retrieved 26 May 2009. ^ "Accident synopsis 06021983". 2 June 1983. Archived from the original on 11 June 2009. Retrieved 24 May 2009. ^ "Famous Gimli Glider retired from Air Canada service". Vancouver Sun. 24 January 2008. Archived from the original on 29 June 2008. Retrieved 24 May 2009. ^ "Transportation Safety Board of Canada - Aviation Investigation Report A97H0011". Retrieved 24 April 2015. ^ "Air Canada AC190 update: Last passenger released from hospital". Retrieved 6 June 2015. ^ "Transportation Safety Board of Canada - Aviation Investigation Report A08W0007". Retrieved 6 June 2015. ^ "Air Canada B773 at Toronto on May 28th 2012, dropped engine parts on departure". Retrieved 24 April 2015. ^ "Air Canada AC624 touched down 335 metres short of runway, TSB says". 29 March 2015. Retrieved 24 April 2015. ^ "Air Canada Provides Update #3 on AC624". Retrieved 24 April 2015. ^ "Air Canada Flight 624 crash investigators recover cockpit recorders". 31 March 2015. Retrieved 24 April 2015. ^ "C-FTJP Air Canada Airbus A320-211 – cn 233". Planespotters.net. McArthur, Keith (2004). Air monopoly: how Robert Milton's Air Canada won and lost control of Canada's skies. M & S. ISBN 0-7710-5688-5. Milton, Robert (2004). Straight from the Top: The Truth About Air Canada. Greystone Books. ISBN 1-55365-051-4.